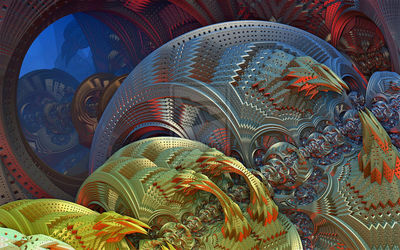 Does it seem that no one has any interest in the old, 2D fractal images anymore? And furthermore, does it seem that since the advent of the 3D fractal craze that there are more fractal artists making interesting work than ever before? I’d answer yes to both those questions. 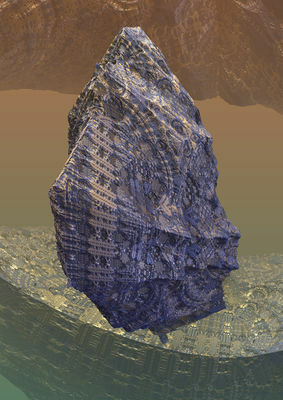 Numerous times while browsing further and further back in an artist’s gallery on Deviant Art I’d come to the “Before Mandelbulb” era and their notable gallery all of a sudden reverts to UF layering trash. 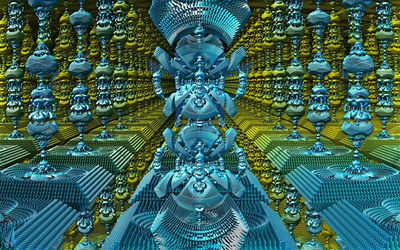 It’s like the mandelbulb and it’s various other 3D formulas have given many artists superpowers which the old “flat” fractal programs failed to do. In addition to that, quite a few fractalists are becoming more proficient with the 3D tool set and actually experimenting with non-fractal elements in order to be more creative. 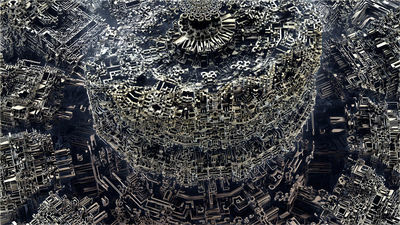 There’s something about the 3D fractal genre I think that makes it easier to relate to and work with. It’s more fertile ground. And less abstract? 3D fractals seem to be more realistic or at least, more “concrete”. Or are the 3D tools just much more powerful and better able to generate interesting imagery? 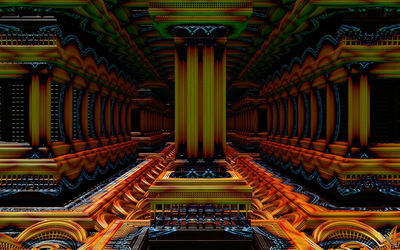 A few hours playing around in the mandelbulb programs will allow almost anyone to find something interesting? 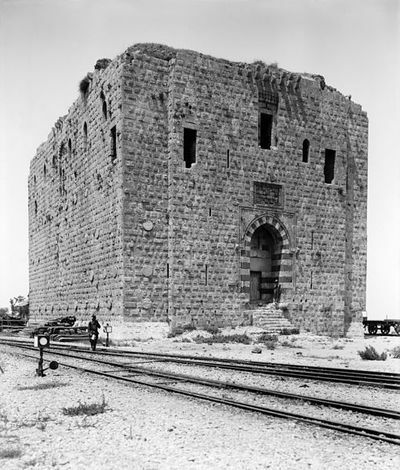 Like being let loose in some newly discovered lost city with a camera; you can’t fail to bring back something shocking and awesome. HalTenny brought us the famous “onion” or 3D metal boiler and enamelled piping images which quickly became a small rendering rage in themselves. And just as with those, he lead the way. This new variation looks even better and creates incredibly bizarre and yet realistic looking works. The use of “fog” to give a photographic depth of field effect works well to give a sense of immensity to the rusted metal structure. HalTenny’s Deviant Art gallery is well worth taking a look at. 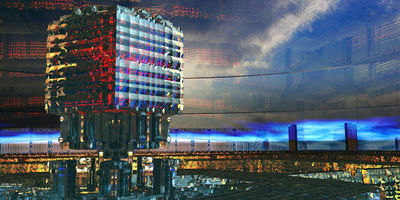 His work just gets better and better and the high quality of the graphical rendering is state of the art. He comes up with great, new variations of formulas and he’s a rendering perfectionist. A great combination of talents. Some people like to add trees, lakes and birds to their images. We don’t need them. They can eat lead and taste shrapnel if they ever come around here. Nice dreamy Maxfield Parrish sunset, don’t you think? I like that. 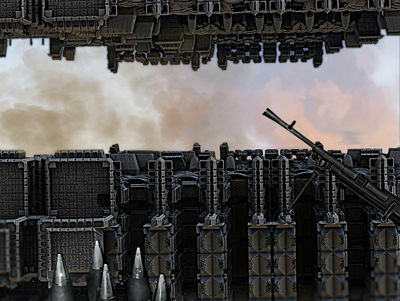 It’s a delightful contrast to the cold machine gun and artillery shells and harsh steel walls of this creatively rendered mandelbox, mandel-something. Who is this ZZZ_spb guy? I like his style! It doesn’t get much more 3D than this. I keep expecting to see someone walk in through one of the passageways. 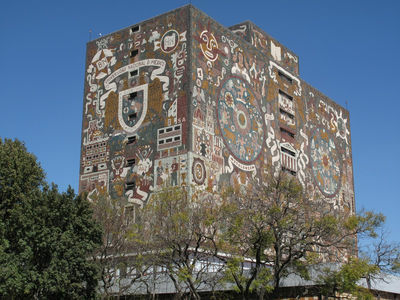 It’s a temple, cathedral or something grandiose like that. And with the “fog” feature the depth is so realistic it reminds me of big budget CGI movie scenes like the last Harry Potter movie. 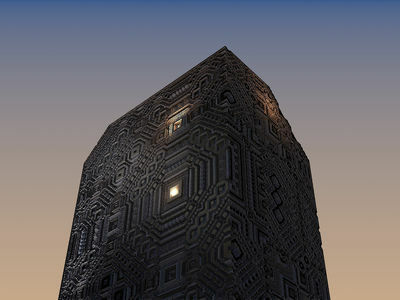 Since i know it, i’ve always been fascinated by the architectural structures of ABoxMod2. 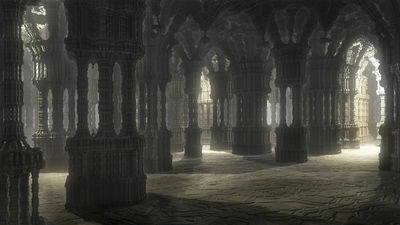 To me it looks like a big pillar hall where all the fractal formula masters have their place. In this case i pimped it with _rotatedFolding, HeightMapIFS and Photoshop. Hope you like it. As you might can imagine I just had to take a further walk through the hall of masters until Julia brought me a view stages deeper to show me the gallery, a sort of shrine krypta, but empty. And it seems no coincidence that my very first thought was: Right Julia … where all the masters have their place. 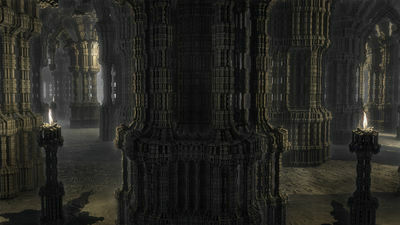 I understand this as a preview and i’m thinking of filling these shrines with shining and illuminating classical fractals. This could be the place of Mandelbrot for example. Right behind might be Pythagoras’, Sierpinski’s or Menger’s .. don’t know .. any suggestions? Suggestions? Yeah I’ve one: Skulls! The Alchemist collection is a set of shiny metallic mandelbulb designs presented as jewellery which you can see by clicking on the image and checking out the original gallery page. 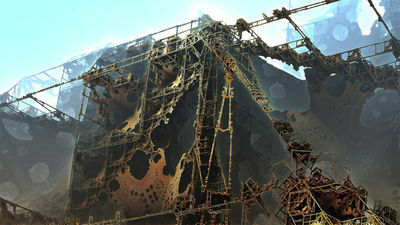 Tahyon has quite a bit of skill as a designer as well as a fractal artist and here the two talents merge perfectly. I’ve always said that 3D fractals were very ornate and would work well as decorative items. 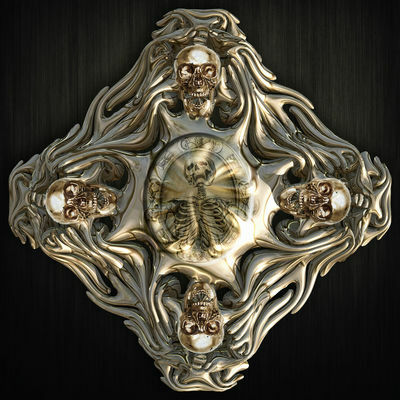 The skulls (and the screaming skeleton) just add a little polish to the fractal. Found this ‘ship’ departing from the area of ‘Thedus Station’…. Managed to get an inside view of Luca’s new ‘discoballIFS’ formula; playing about with iterfog gives some interesting – but unpredictable! – transparency ‘diffraction’ effects. The “diffraction” effects he’s referring to are quite creative. They almost look like something a photoshop filter would have produced. Just as HalTenny’s renderings are super clean and perfect, this one is rough and wild and yet reaches a similar level of perfection in a very different category of style. 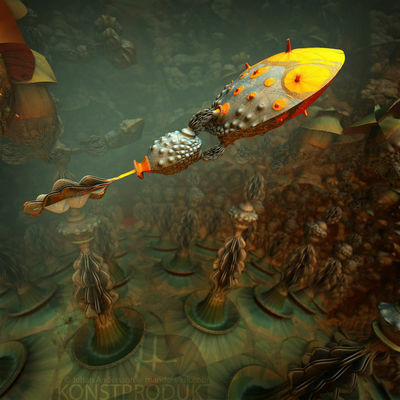 Mark has worked as a professional illustrator, photographer and photo-restorer and somewhere I read that his goal with 3D fractals is to create sci-fi illustrations. I think he’s achieved that goal. 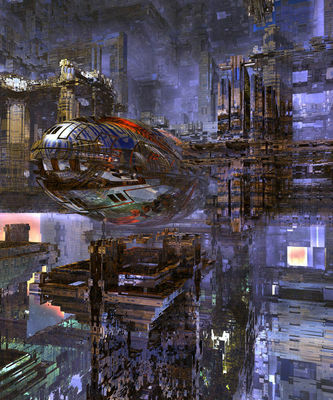 Kraftwerk, on Fractalforums.com, or Mandelwerk on Deviant Art has really tried hard to take 3D fractals to that higher level of more expressive, cerebral art. This actually is not a good example of that, but it is a good example of his rich and sophisticated coloring, an artistic quality that is less exploited by 3D fractal artists than it is by the 2D ones. I like the shape, color and pattern to the fish object and the rendering is so photo-realistic that I would expect on closer examination to see that it’s carved from wood and covered with a thin layer of plaster and paint. My second image of the two horrible events that took place in Japan in August 1945. I hope I will never have to create a third image. Thinking of the hundreds of thousands people who lost their life and to those whose life is still affected by the aftermath of the atomic bomb. My own photo of sky added in Photoshop. The stylized high buildings and twisted structures gave me the image of the vision I had as a child when I heard about what once had happened in the City of Hiroshima. I have been working on this piece for almost a month to get the disposition and ambience exactly as I wanted it to be, to show my respect for the hundreds of thousands people who lost their life and to those whose life is still affected by the aftermath of the atomic bomb. I hope mankind will never use these terrible weapons again. Can fractals be thought provoking and express ideas and not merely delight our eyes with beautiful designs and ornate details? You know, maybe he’s done it and that without leaning too heavily on Photoshop to make mere fractal “elements” into something completely different. Well, it looks like Mandelwerk’s pair of fractal images has managed to express and evoke something more substantial than the usual eye candy wonders. I could see something like this made into an actual outdoor sculpture/memorial type of thing. An artist like that deserves his own public exhibition. 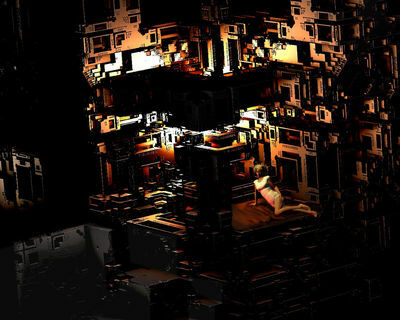 Browsing his Deviant Art gallery will quickly show you what I mean by his unique graphical style and persistence in trying to move fractal art to a higher level. I’ve said it couldn’t be done, but I was just speculating on the future based on all the junk we were all making at the time. The detail isn’t just of high quantity, which is easy enough to find in any fractal formula whether 2D or 3D even, the detail is also of exceptionally high quality and shows the processing power of these formulas to create unimaginable imagery. This is the world’s most complicated clock or circuitry as the name suggests. Skyzyk ignored the rules about color when he made this image. Or is Skyzyk now writing the rules about color? Ironically, this 3D image has a flattened appearance to it. But the plastic look it has is why I like it so much. These are distinctly artificial colors if one can say that in the context of digital art. It’s the bowels of a machine, a plastic extruding, super-advanced toy factory (and shiny!). It’s eerie and creepy and the pillars look like they’re made of celery –celery gone bad and yellow– and all this because of the color! Nice touch. 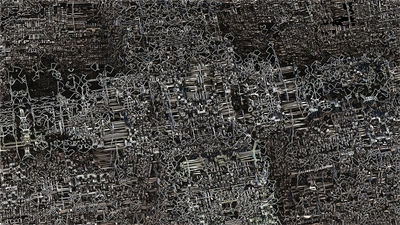 Not an uncommon 3D fractal rotary cheese-grater image. But transformed into something radically different and resembling a hand-drawn comic book image by Skyzyk’s mysterious color talents. If you look closely at the full-size image on Skyzyk’s Deviant Art gallery page, you’ll see the artistic effect his coloring style has on the “drive shaft” structure. My work is not and should not be considered Public Domain. All my works are watermarks embedded with Digimarc. My works are not to be shared anywhere without my express consent and written permisssion. Please note that my parameters are available upon request. If you would like to download the full image, or as a print, also, please notify me. Member of #GetWatchers: We help Artists to expand their audience. Expand yours… You can Join us Here.OU!!! HDR? Maybe that and the Photoshop finishing explains the stylish look. This HDR is the same thing that photographers (like Ron Fitch) use to combine several versions of the same shot with varying levels of contrast to make a richer image with more “pop” as the Dynamic Photo HDR website says. Didn’t know you were back at it until today. I appreciate the kind words. I try to create pieces beyond the mainstream work we often see, sometimes I get there. :) Thanks again.